Is your body ready to be controlled by millions of people? REDMOND, WA- The Twitch Plays Pokemon experiment has taken the world by storm, with over 24 million views total and an average of around 80,000 viewers at all times. 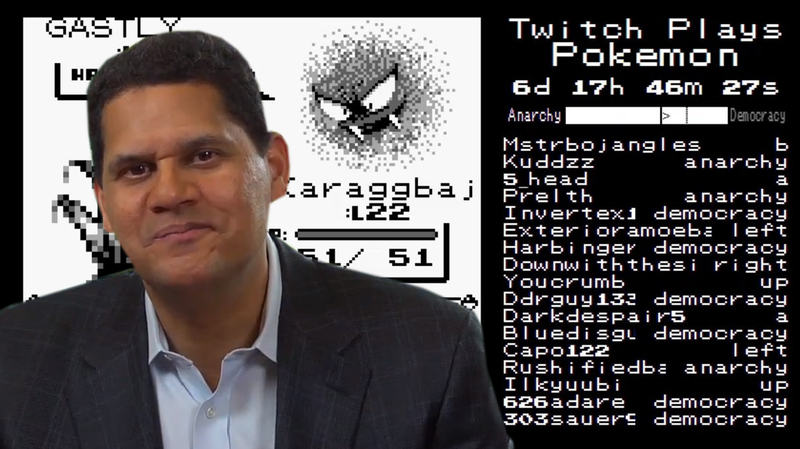 Twitch Plays Pokemon sees the viewer of the ongoing Pokemon gameplay input commands to control the actions of Red, and with thousands of people making actions at once, the results can be quite chaotic. The social experiment has spawned several memes, and has caught the eyes of the media. But that’s not the only eyes it has attracted. Reggie Fils-Aime, President of Nintendo of America, held a board meeting recently with Satoru Iwata, CEO of Nintendo, Shigeru Miyamoto, Senior Game Designer, and Satoshi Tajiri, founder of Game Freak and Pokemon’s creator, to discuss the possibility of profiting from this media sensation. The meeting, spearheaded by Fils-Aime, brought up several ways in which Nintendo could not only build money, but also notoriety, after the Wii-U’s lifetime sales were surpassed by those of the Xbox One and PS4. CEO Satoru Iwata then took the floor. “We can also profit from the stream that is currently ongoing. Pokemon is Nintendo and Game Freak’s intellectual property. We have the right to make money from it, and to take down the stream if the creators don’t comply. We have already contacted lawyers to talk to the executives at Twitch, as well as the stream’s creator. Soon enough, we will see ad revenue from the streams, as well as an estimated one million in sales from Helix Fossil and ‘Bird Jesus’ [two memes from the stream] T-Shirts.” The meeting ended soon after. If this venture is successful, based on Twitch ad revenue ($3 for every 1000 ads), Nintendo could potentially make $240 hourly, which by the projected time it takes to complete the game (about two weeks, based on similar streams), would amount to around $80,000. To a company like Nintendo, this is chump change. However, the big killer here would be in merchandising and promotion of the company and the Pokemon brand. If even only 100,000 people bought a Helix Fossil t-shirt, after production costs, Nintendo could potentially make $2 million if the net profit per shirt is $20 after $10 in manufacturing costs. But Pokemon isn’t the only game Nintendo plans on doing an interactive stream with. There are rumors of plans to do “Twitch Plays Earthbound,” “Twitch Plays Fire Emblem,” and even “Twitch Plays Animal Crossing: New Leaf” with a new interactive stream every month. If the rumors are true, Nintendo could make tens of millions in profit from merchandise a year. This business venture could certainly be the turnaround Nintendo needs. -The Honorable Baron Dr. Rip Bang, PhD, DFA, Esq., DA., OBE.